DigitalServer Review 2019: Is DigitalServer a Good Hosting? DigitalServer hosts over 20,000 websites on its powerful servers and guarantees all of them an uptime of 99.9% all year round. The Mexico-based vendor’s hosting solutions can fit any website whatever the size. 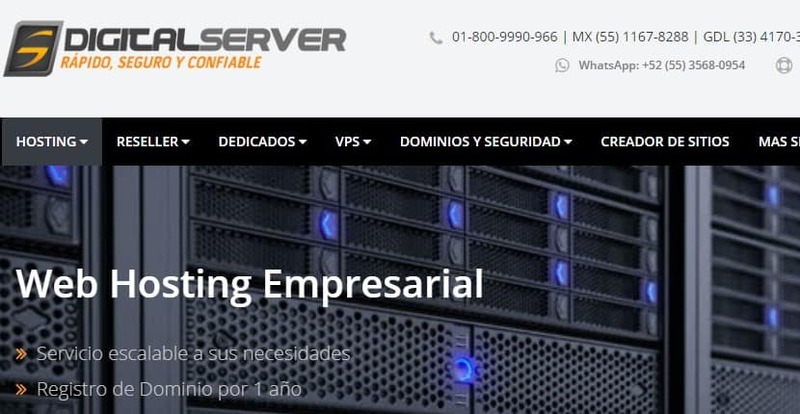 For over 19 years, DigitalServer has been providing outstanding hosting services to individuals and organizations across Mexico. Today, DigitalServer hosts over 20,000 websites on its powerful servers and guarantees an uptime of 99.9% all year round. It has also extended to several other countries including Colombia, Peru, Spain, and Argentina. Website migrations – DigitalServer helps you migrate your website from your old website hosting provider and configure it in its servers. A lifetime of free SSL – You only pay a small fee once to get the SSL security for as long as your website exists. State-of-the-art tech solutions – All DigitalServer service offerings use modern technologies to keep your website performing perfectly. The company uses enterprise level servers that have ultra-high performance SSD and SATA III disks installed. Fast loading websites – DigitalServer assures all its customers of fast loading websites with as much as 1Gbps connections available. What’s more, the package plans are easily scalable in just a few easy clicks. DigitalServer website hosting solutions can fit any website whatever the size. You can also contact the vendor for custom solutions. Small business can choose to work with the Mini Plan, the Supermicro Plan or the Micro Plan while medium-sized and large businesses can choose to any of these three: Commercial, Corporate or Business Plan. What’s more, this Mexico-based hosting provider offers a 30-day money back guarantee to any organization that is dissatisfied with its services. The company promises to refund 100% of the payment you make if within 30 days you realize that their hosting solutions are not quite the perfect fit for your website. However, this DigitalServer guarantee only applies to payments that are not made in cash. One noteworthy downside of DigitalServer solutions in web hosting is the fact that the company has not added live chat capability on its website. Today, live chats are quite popular, and increasingly, customers do expect to be able to talk to a hosting provider’s support team via chat. All the same, with an active social media presence, customers who need to talk to DigitalServer support team via chat can do so on social media platforms like Twitter and Facebook. DigitalServer has a WhatsApp number through which customers can reach out to its support team. In addition, DigitalServer ticketing system works perfectly, delivering fast and helpful support to individuals and businesses that have subscribed to its hosting plans. In my experience, my issue was resolved in a matter of minutes. Keep in mind that DigitalServer support team is available 24/7. For hosting emergencies, you can use the phone numbers the company has provided on its website to get in touch with its support staff. The website is only available in Spanish but the technical support team offers support in both English and Spanish. DigitalServer offers outstanding hosting solutions for Mexican businesses as well as enterprises in several other countries including Peru, Colombia, Spain, and Argentina. Its flexible packages allow you to scale up as your business grows. Wondering how DigitalServer stacks up against other Web Hosting companies? Enter any other Web Hosting company and we will give you a side-by-side comparison.